If you thought updos were limited to weddings and proms, you are way wrong. An assortment of the seemingly hard-to-achieve coiffures (anything that requires lifting our arms past our ears is doing too much) can be constructed with nothing but a hair tie and a tail comb. We’re not saying they’re all as easy as throwing your tresses in pigtails but perhaps you’ve been overlooking their simplicity. In which case, we’re here to debunk your not-so-stoked thoughts about putting in work to wear updos, with a round-up of the most beautiful updo inspiration from Pinterest. Keep scrolling for ideas on how to get lifted (locks) now. We happen to know the stylist behind this gorg, laid-back braided bun—Emma Chen hailing from down under. Start with bedhead and a deep side part then adorn your messy bun with a braid. In case you can’t tell, under those runway-ready rose hair accessories is a super simple low ponytail twisted into a bun—easy peasy! Surely you own hair ties. Now drop by your local craft store (or dig up an old ribbon) and go to town on that whimsical topknot. Futuristic and sleek, this inverted updo requires one big, statement-making barrette and a few pumps of your favorite frizz-fighting hair cream. For those who are more skilled in the braiding department, don a backyard mohawk braid—the out-of-the-face mane makes way for a dramatic eye or bold lip. Updos don’t have to be refined. To make throwing up your hair fun, create two buns on each side of your head, a little below your crown. No bangs? No problem. Check out our faux bang guide. Leave the ends out of your messy bun for an effortless spin on the half-up. It looks complicated (and no lie, you’ll probably need a helping hand), but when you feel like unleashing your inner galactic girl, go with this lychee-colored sandwiched updo. Leaning toward elegant? The croissant-shaped updo that is a French twist is for you. Click here for a five-minute French twist how-to. Slick back your strands and smooth them over into a low ponytail, then twist up and merge the tail to the base with another elastic for a bird of paradise-esque style. A braid-full ‘do is never dull. For those who aren’t braid inclined, print out this pic for inspo when you visit your stylist. 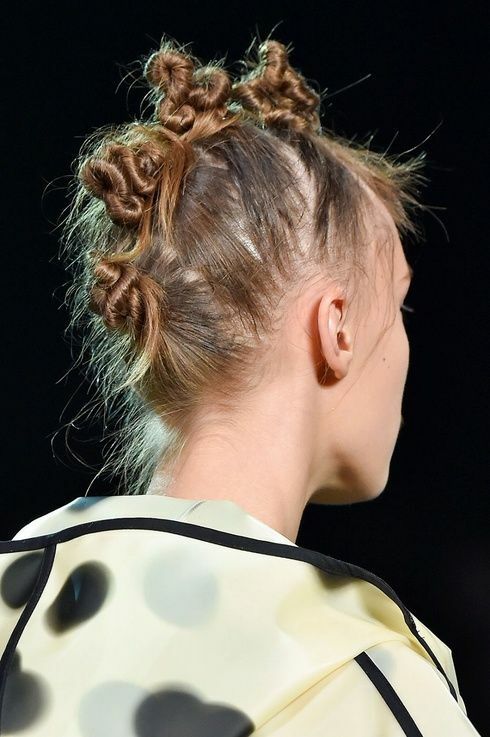 The key to cool-girl mohawk buns is clean lines and unwavering wisps. To get a chic, Parisian upside-down braided updo, here’s what you have to do. If Princess Leia were around, this is the update her mane would’ve gotten. Literally, no effort required—and still occasion-worthy. So cover-worthy, we can’t get enough. After you’ve adorned your low bun with a grand floral accessory, grab a scone because you’re ready for an Alice in Wonderland tea party. Tying the knot soon? Peep our bridal hair Pinterest gallery.